...but still no mention of US 12 or US 16. So where did those routes terminate? 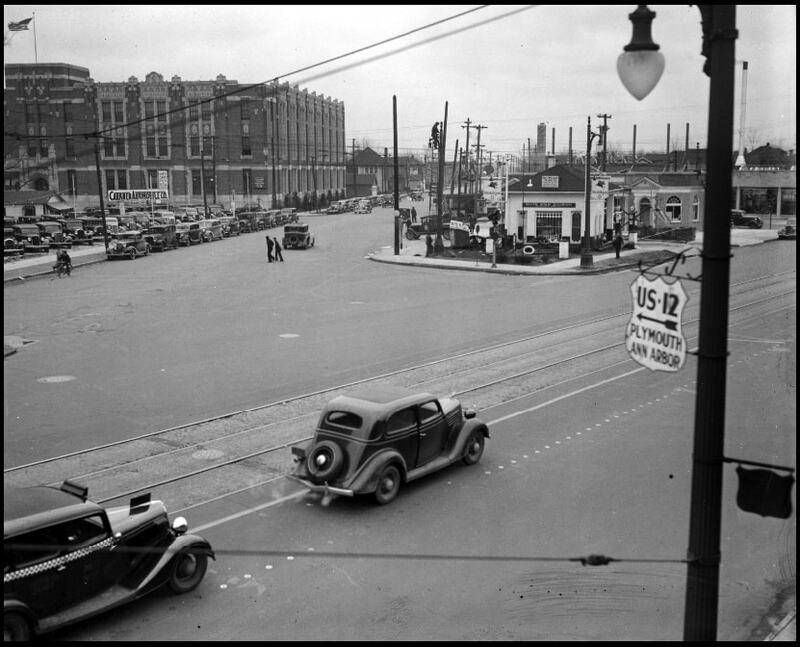 The cars in the foreground were heading northwest on Grand River, while the road heading into the distance was Plymouth; note the US 12 shield at far right. 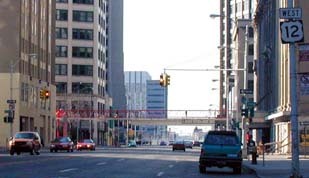 That was looking west on Michigan, approaching the point where US 12-16 began to the north on Washington in order to get to Grand River Av. 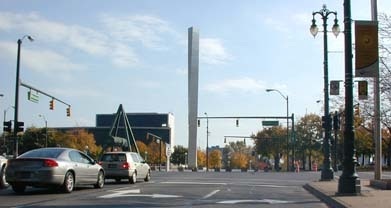 (the "R" shields directed US 12 and US 16 traffic to turn right). 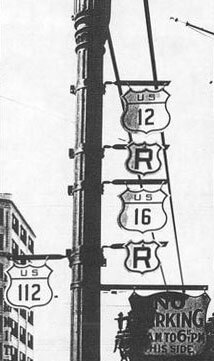 That was US 16's only Detroit terminus, and it lasted for 35 years (until 1962, when US 16 was completely removed from Michigan). 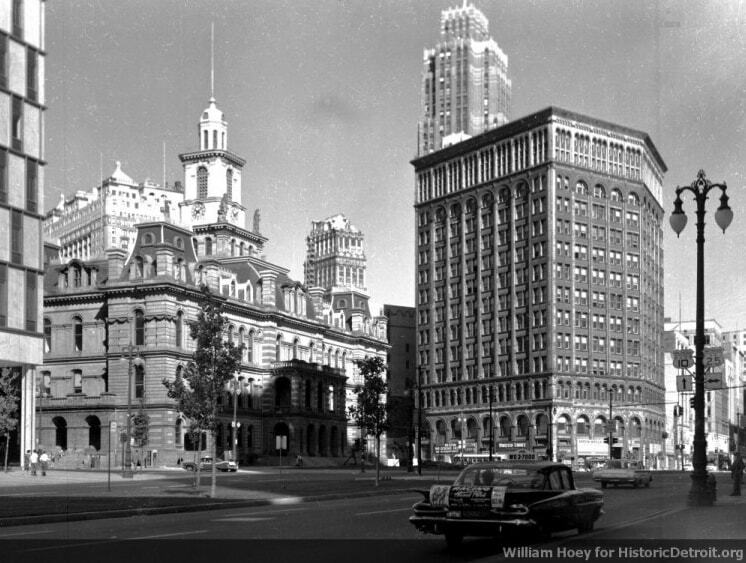 US 12 ended there until 1956, and then for a few years US 12 traffic was directed onto what is now known as the Edsel Ford Freeway. That highway was also signposted as I-94, but reportedly the US 12 designation ended at Woodward (US 10). 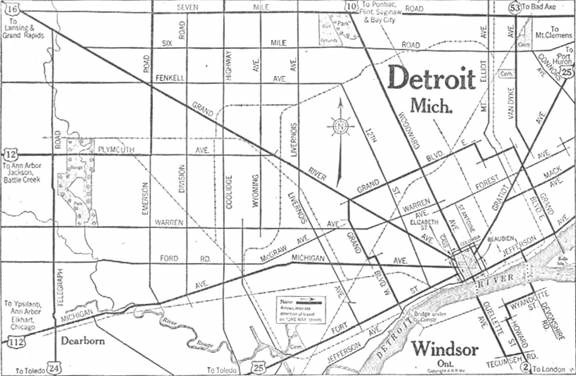 Regardless, that arrangement lasted for only a brief time, because in 1962 MDoT decommissioned the US 112 designation, replacing it with a rerouted US 12. 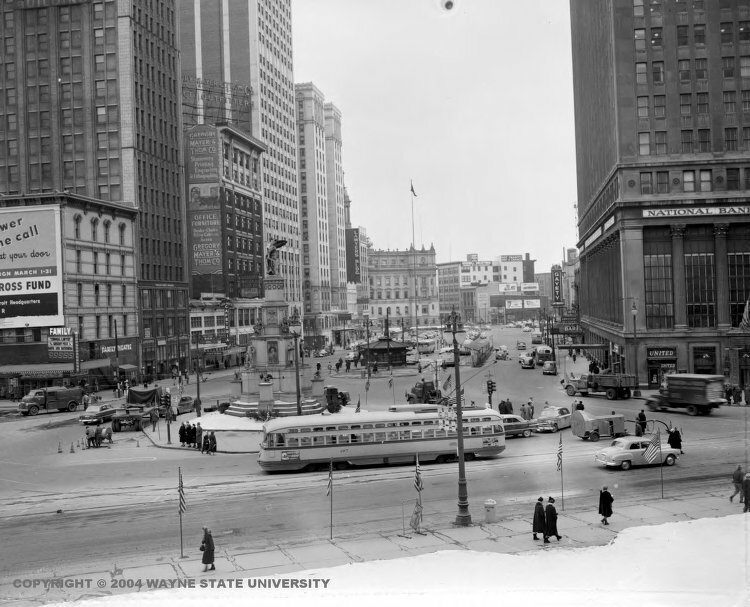 So then US 12 ended at Campus Martius, where US 112 had previously terminated: on Michigan at Woodward (although by then the old City Hall had just recently been torn down). 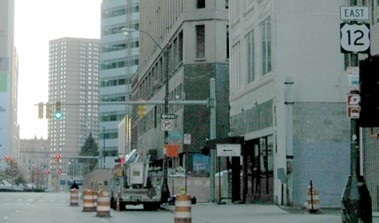 In 2001, in preparation for the Campus Martius redevelopment, the US 12 designation was removed from those four blocks on Woodward. 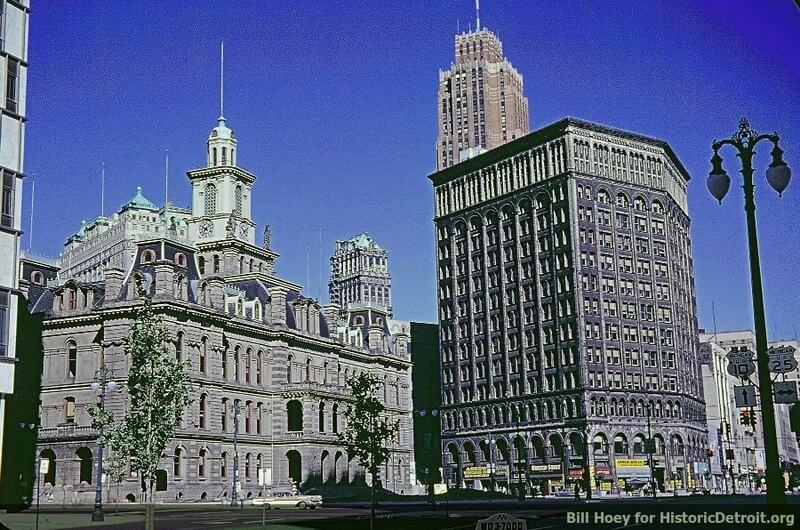 Additionally, US 12 was removed from one block of Michigan Av, such that its new terminus was there at Griswold. Currently that intersection marks the east beginning of US 12, and historically the first confirming marker was posted one block later, just past 1st Street, but by 2017 it had been removed. 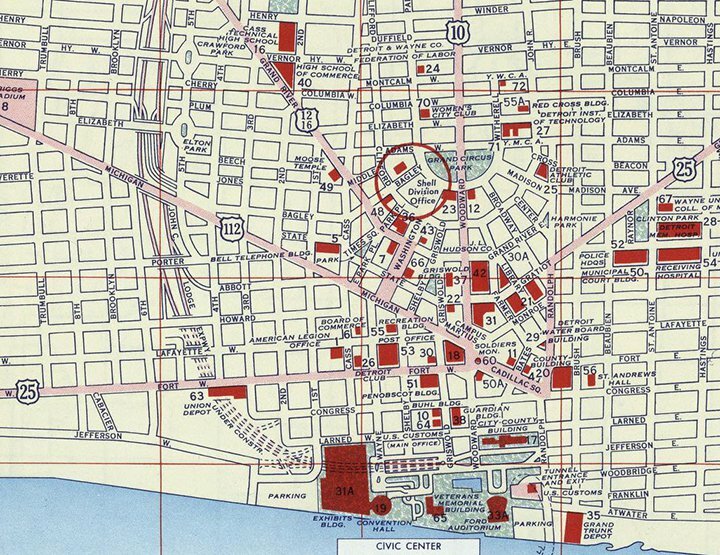 That was the east end of US 112 until 1962, and then the east end of US 12 until 1981. 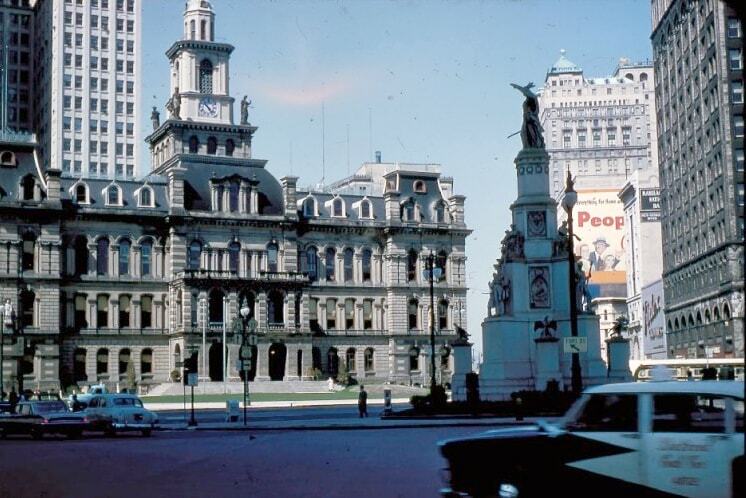 Many additional things have changed since the '50s: Michigan has been at the forefront of the movement to decommission US routes, and US 12 is the only one that still serves downtown Detroit. Of course the radial avenues are still there, but today most traffic uses the newer network of freeways which obscure the grand design of the underlying street pattern. last updated Jul. 29, 2018.